"Rebel With A Cause!" Hot Air Balloon! 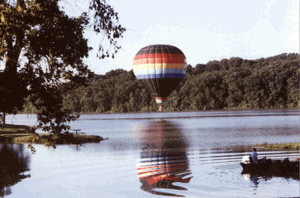 Here is our Ride Balloon as we do a "Splash and Dash" on Lake Aquabii just south of Indianola, Iowa. This a National Ballooning LTD AX-8 that holds 105,000 cubic feet of air. We can fly up to 6 passengers in this balloon. The average hot air balloon is around 65,000 cubic foot.